Treats itchy, flaky scalp. Effective treatment for scalp psoriasis, seborrhoeic dermatitis (dry, itching scalp) and dandruff. Treats your scalp, cares for your hair. Neutar? 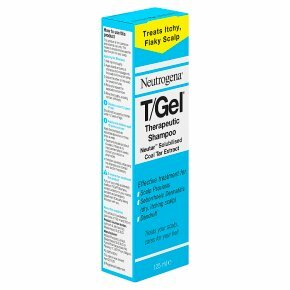 Solubilised Coal Tar Extract What the medicine is for Neutrogena® T/Gel® Therapeutic Shampoo is a fragranced medicated shampoo which should be used two or three times a week, for the treatment of itchy, flaky scalp disorders such as dandruff, psoriasis and seborrhoeic dermatitis. Regular use helps control these problems, while leaving your hair shiny and manageable. The shampoo can be used by adults and children aged 12 years and over. Before using the shampoo This product is suitable for most people. If you are in any doubt about using this product talk to your doctor or pharmacist. How to use this product This product is for cutaneous and external use only. This means it should only be used to treat the skin on your scalp. Applying the Shampoo 1) Wet hair thoroughly. 2) Apply liberal amounts of shampoo and massage into the scalp to form a rich lather. 3) Leave the lather on the scalp for several minutes. 4) Rinse and repeat the application once more. 5) Rinse thoroughly, avoiding contact with eyes. Children under 12 years of age Should not be used by children under 12 years of age. Adults and children aged 12 years and over Apply the shampoo as described above two or three times a week. Treatment should last about 6 weeks. If there is no improvement after 6 weeks consult your doctor or pharmacist. If irritation develops, stop using the shampoo and contact your doctor if necessary. If anyone has swallowed this product If you or your child accidentally swallows T/Gel® Shampoo, contact a doctor or your nearest accident and emergency department (Casualty) taking this pack with you. Retain carton for full instructions. ers of benzoic acid, benzyl benzoate and butylated hydroxytoluene (E321) can mildly irritate the skin, eyes and mucous membranes.